Design and proportion are the things that stand out in any Wes Anderson film. But in his new film it is Art with a capital ‘A’ that stands out. Art is the looming plot engine in Anderson’s excellent new film, “The Grand Budapest Hotel”. The film travels back in time through a series of flashbacks, starting first in 1985 at the grave of a writer who had visited the hotel, then to 1968 when that author dined with the Hotel’s owner, Zero Mustafa. And then finally the film flashes all the way back to the 1930s when Zero was a protégé of Mr. Gustave H. (played by Ralph Fiennes). Many critics have pointed out the whimsical nature of much of the film, how it carries us to a simpler time before the horrors of the Second World War and the holocaust. A prison scene with Fiennes and his jailmates using a “throatslitter” to divide sweets made me laugh out loud, and also a little queasy. But the dark final act reveals the fictional art dispute at the core of the film. It sets up the kind fo dispossession and tragedy that have been seen in countless Nazi-era art disputes and calls for return. The kind of art dispute that requires complex discovery and is told from the different perspectives of family owners, possessors, good faith possessors, bad faith buyers, and heirs. Which is in a way how the film is constructed. So this portrait is a study in temptation, and as such it is inflected with a sensuality typical of mannerist art. In 16th-century Europe, artists bored by the classical rules of the Renaissance portrayed the human figure in a more “mannered” way, stretching out limbs and necks, distorting poses. This youth’s long fingers are typically mannerist. So much about him – his short hair, finely clad form, those hints of depravity – echoes the mannerist geniusBronzino. It’s not hard to work out how such a painting found its way into an art collection in central Europe. The eccentric Habsburg Emperor Rudolph II, who filled his palace in Prague with curiosities,lured many Dutch and Flemish mannerists to his mad court. The Habsburgs were the greatest art patrons of the Renaissance, and the heritage they left behind is rich in masterpieces of Boy with Apple‘s ilk. This is exactly the kind of painting you can expect to see in Vienna’s Kunsthistorisches Museum, theSzépművészeti Múzeum in Budapest or the picture gallery of Prague Castle. 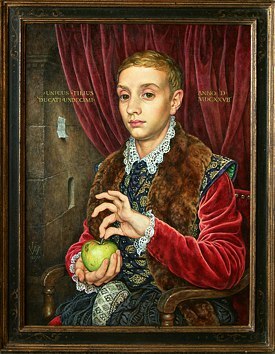 Boy with Apple really is priceless, as an art history in-joke. At one point in the film, the painting has gone missing, and strewn about the grand sitting room are other works by artists. Artists whose works have also been the subject of art restitution suits like Gustav Klimt and Egon Schiele. Those works appear frequently in the film, and it is perhaps no accident that the noble hero of the film, played by Ralph Fiennes also shares a first name (and libido!) with Gustav Klimt. The film grounds itself in a fictional Eastern-European country on the cusp of the holocaust and the Second World War. The end of the film is faithful to that 20th century tragedy, and it stands as a far more eloquent telling of the story of art during conflict than the Monuments Men and other films of that ilk. The multiple flashbacks reveal the difficulty in recreating memory and a story through so many narrators, an obstacle courts also confront in examining Nazi-era art suits.